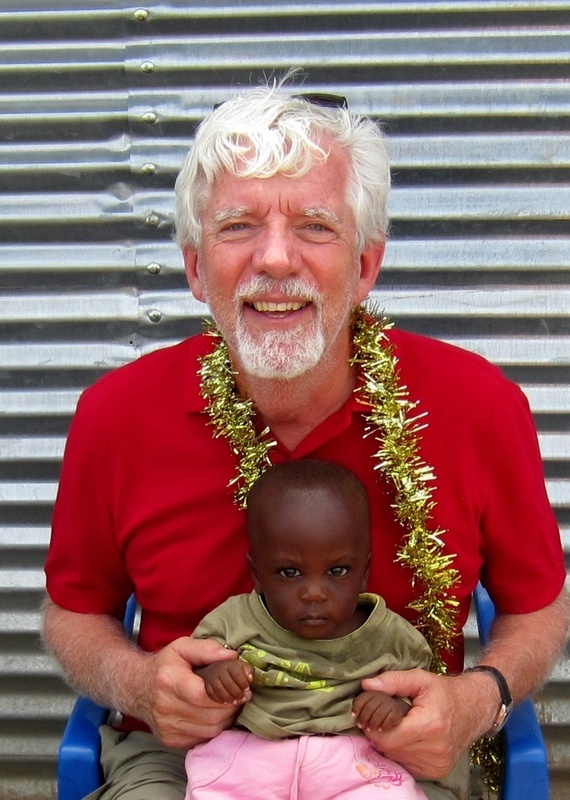 My father, Stewart Geddes, has been generously supporting the development of a small rural school in Kenya for the past couple of years through the CanAssist African Relief Trust. Today I headed back across to the mainland on the ferry to visit the community and the school which has about 75 students from age 3 to 8. Without this small school these little kids would have to walk several kilometers every day to receive education … or not get any at all. Girls, in particular were at a disadvantage and only two girls in the community of 500 people, have gotten beyond grade 4 until now. I was enthusiastically welcomed and treated to demonstrations of counting and identifying animals in English (remember this is a seoond or maybe third language for these young pupils.) The name S P GEDDES EARLY CHILDHOOD DEVELOPMENT CENTRE is emblazoned on the school gate and the children were happy to chant a Thank you message that they wanted me to take back to my Dad. Me and little Stewart Geddes at Osiri Village, Kenya. But the big surprise for me was when the head teacher showed me her six month old Grandson. “We have named him Stewart Geddes”, she said. “At home he goes by Geddes.” I found this both amusing and touching. When I got back to Mbita, I called Dad to share with him the deep appreciation that this community has for his gift to them. I plan to visit a few CanAssist project sites in the next several days and I know that this is just the beginning of the wonderful expressions of gratitude to Canadian Donors through CanAssist that I will receive. I wish that this was something that I could bottle and send back to share with all of you who have supported what we do through CanAssist. Perhaps this little video clip will give you a taste. This entry was posted in Uncategorized and tagged Africa, Asante, CanAssist, CanAssist African Relief Trust, donor, Kenya, Osiri, school, Stewart Geddes, Thank you by johnageddes. Bookmark the permalink. What a heart warming story! May God richly bless little Stewart Geddes…older Stewart Geddes too. What a rich “return” on your father’s investment in the lives and education of these children! The stock market goes up and down, along with our investments in RSP’s and TFSA’s. Investing in the lives of vulnerable children yields riches deep in the soul. John, please accept my condolences on the passing of your Dad, a man for whom I had great regard, and equally your Mom of course). Jamie sent me your Facebook entry, as I’m not on Facebook. I understand you and I are coincidentally on stage. I’m portraying Uncle Ben in Death of a Salesman at the Palace here in London. Break legs! Please express my condences to Bob and all the family.